Stories involving PhD Animal Welfare students. 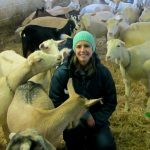 After completing her PhD in 2006, Frances Flower joined the Whole Foods Market team managing the day-to-day operations of their animal welfare program. Living in a shelter can be a very traumatic experience for an animal – something Nancy Clarke has witnessed first-hand over her years working at the Vancouver Animal Shelter.